In this year of RAF100 the Museum is proud to be working closely alongside The Royal Air Force and other significant international organisations to commemorate the establishment of the world’s first independent air force. In addition to this milestone, the RAF has collaborated with many other air arms across the decades since its formation 100 years ago when the vast majority of British squadrons was based at St Omer in Northern France. 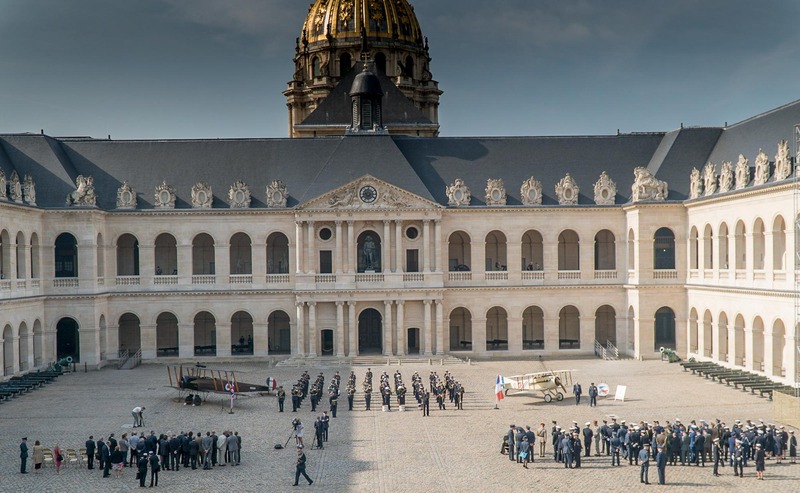 So we were particularly thrilled to be approached by the RAF and Armee de l’Air to create a special exhibition at the majestic Les Invalides in the centre Paris at the end of May. The previous blog article on the event gives more details about the exhibition, you can read it here. Many visitors and supporters of the Museum have really enjoyed seeing the huge international press coverage of the event and we’ve had quite a few asking how we were able to do it; where the publicity about the event was seen and what the reaction has been one week later across the world. 100 Years Of Collaboration In The Air – Les Invalides, Paris, May 2018 from Yorkshire Air Museum on Vimeo. The event was of global significance and involved large numbers of diplomatic and political attendance, so unlike other projects that we do and publicise well in advance, on this occasion we had to remain a little tight-lipped until the day of the ceremony. The Importance of Our Special Relationships. The Museum enjoys special relationships with many government and high level organisations. As home to The Allied Air Forces Memorial, Museum Director Ian Reed is constantly in touch with high level contacts across the world and as the Museum’s reputation has grown, these personal contacts have allowed our events like The Allied Air Forces Day to grow into well established memorial occasions where diplomatic, political and senior air force representatives can gather together to take a moment to meet and to pay respect to those who sacrificed so much for the peace we have enjoyed since World War II. 77 squadron were the very first residents of RAF Elvington, before moving to allow the two French Squadrons to be based here. The Museum’s expertise in transporting aircraft like our AVRO 504K to Thiepval in Northern France for the significant centenary commemoration of The Battle of the Somme for the British Government in 2016, meant that the Museum’s Management Team were the obvious choice to design and deliver a project on the scale of the Les Invalides exposition in Paris. How To Display Two WW1 Aircraft Inside of Les Invalides in the Centre of Paris. Obtaining permission from the Military Govenor of Paris for the use of France’s most iconic state building, Les Invalides, is an obvious significant step, which our Museum Director undertook through his personal links. Obtaining the licences, permissions, timings, accomodation, feeding and planning for the staff and for two large articulated trucks is no mean feat. Bringing the huge 16 tonne lorries across a foreign country, through the centre of Paris and then through the narrow 17th Century Louis IV archway into the cobbled courtyard as Napoleon looks on, is not to be taken lightly. Our friends at Middlegate Europe stepped forward once again to deliver the AVRO over 600 miles to our destination. Meanwhile at our request, our friends at Conservatoire de Air et Espace d’Aquitaine in Bordeaux were busy preparing the beautiful 1916 SPAD VII fighter for transportation 360 miles east to Paris. As the event preparations progressed, our Museum Director Ian Reed and Deputy Director Barbara George worked on the complicated logistics of moving staff and aircraft, whilst navigating the complex task of co-ordinating with various authorities. These included the French Police, Gendarmerie, City Mayor’s office, Governor of Paris and Les Invalides, who all obviously wanted the minimum of disruption, especially with complicated and restricted Paris traffic regulations on heavy truck movements around the city streets into areas normally prohibited. Add in the fact that the Royal Air Force and Armee d l”Air became ever more enthusiastic and scaled up the size of the guest list for the initial ceremony to include most of the representatives of the world’s air forces with embassies in Europe and we suddenly had a huge global event attracting media attention. As the event grew, military security became more significant and so it wasn’t until the day of the ceremony that anyone at the Museum was able to talk publicly about the event, what it was for and indeed the logistics behind it. The day dawned fine and sunny in Paris with the Yorkshire Air Museum and CAEA teams having only had 4 hours sleep from building the two aircraft the previous day and as we gathered at Les Invalides, the months of planning came together as the RAF and Armee d L’Air bands took advantage of the clear acoustics of the courtyard to create some wonderful music. Representatives from most of the European Air Forces, plus those from as far afield as Israel and Mexico gathered together for the ceremony. Following that, Head of the Royal Air Force, Air Chief Marshall Sir Stephen Hillier KCB CBE DFC ADC MA RAF was joined by Général André Lanata, Chief of the Armée de L’Air who is also Vice President of the Museum together with Lord Llewelyn. UK Ambassador and General Bruno Le Ray, Military Governor of Paris for a press conference in front of the AVRO 504. There was huge media attendance with many live TV channels filming during the event and for the following special press conference afterwards. Over the weekend the public attention in one of Paris’ most visited monuments was immense especially with international visitors. Many visitors to the Museum take away happy memories of the aircraft that they see when they visit. Without a doubt, the sight of the majestic Halifax or the sinister head on view of the Victor have become iconic images of the Yorkshire Air Museum. However, history is all about people. The aircraft we preserve are the vessels that serve as conduits to the memories of the people who served aboard them and those on the ground keeping them in the air. The air crews often faced slim odds on survival, especially in wartime Europe. The event at Les Invalides highlights once again how important people’s relationships with one another are. We are all currently enjoying closer relations with other countries in Europe as never before. Following events where the Museum has successfully displayed historic aircraft outside the Museum, like RIAT at Fairford; RaeS at Hyde Park Corner; Royal Windsor Show; The Somme; Leeds and York’s city centres (including the roof of the Theatre Royal) and the transport of the huge 77’ long Mirage IV nuclear bomber from south of Paris last year, governments and major organisations see how we have done this efficiently, on time and on cost. As a result they see that the Museum is an organisation which inspires people with our ingenuity and ideas and more want to work with us in the future. At the Museum level, we enjoy truly wonderful relationships with other museums, organisations and air forces. We continue to develop these personal links to collaborate with other historic organisations to find ways to engage with people across the world and remind everyone of the importance of friendship and collaboration. Here are links to some of the coverage that the event received across the world.